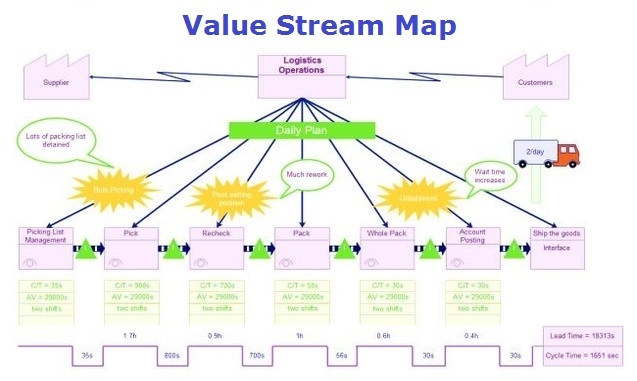 Value Stream Map – Value stream map is a lean tool used to depict end-to-end process that a product or a service goes through from initial placement of the order to completion in the hands of the customer. This is often used to analyze the current state processes and design the future state process. Value stream mapping is used in manufacturing, service industries such as financial industry, logistics, healthcare, software and product development, etc. Value stream maps usually have standard symbols to depict activities. The proper value stream map should separate value-adding processes from the non-value add activities. Another way to separate is by the type of activities, e.g. information flow vs. materials flow. Lead time is usually represented at the bottom of the value stream map to represent the total elapsed time for the order to get to the customer. Note, lead times are viewed from customer perspective and are usually longer than cycle times or internal processing times (e.g. lead time would include time in transit). Value stream maps show value adding times and non value adding times. Time spent on non-value add activities is waste (also known as muda in Lean methodology).